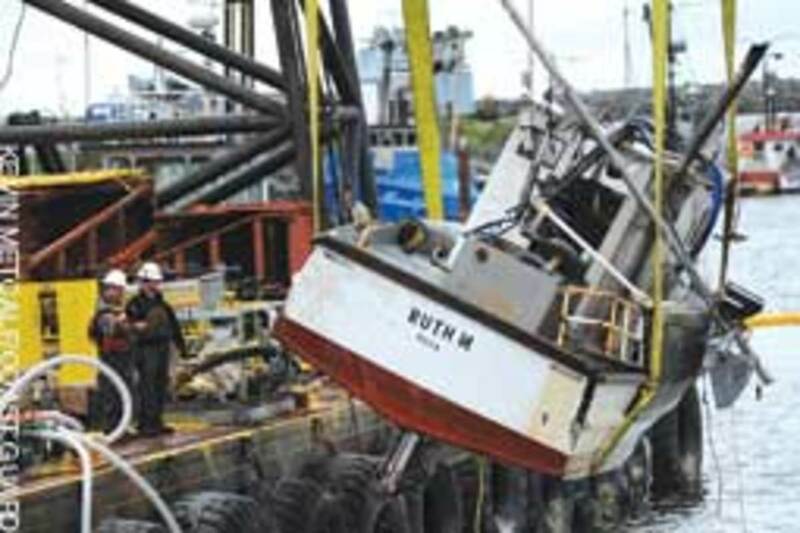 A derrick barge hoists the Ruth M, one of 10 vessels identified as a pollution threat, from the inner boat basin March 26 in Crescent City, Calif. The Unified Command&apos;s goal is to mitigate environmental impact to the harbor so the city can begin to restore it. The Coast Guard found the body of Peter K. Prybot, 63, a Gloucester, Mass., lobsterman, newspaper columnist and the author of two books on lobstering, April 3 off Rockport. Prybot, a respected waterman who loved the sea, was pulled from the water more than a mile from shore at the southern end of the Rockport breakwater. 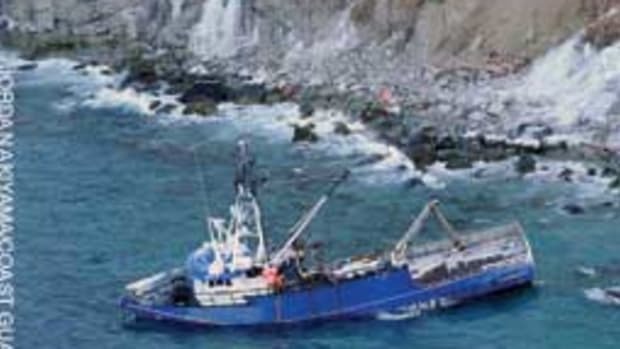 The Coast Guard says Prybot, who worked alone, was entangled in netting attached to his vessel. Locals say he might have been pulled overboard as he checked his traps. He leaves his wife and a son. Prybot had lobstered for 46 years but was also known for his writing. He wrote a local newspaper column, Ebb & Flow, and his photographs were published in Commercial Fisheries News, National Fisherman, Oceans Magazine and the Gloucester Daily Times. He also wrote "Lobstering Off Cape Ann: A Lifetime Lobsterman Remembers" and "White-Tipped Orange Masts, The Gloucester Dragger Fleet That Is No More." The Coast Guard rescued four boaters, including a Miami-based Guardsman, March 24 from a capsized pleasure boat about 20 miles east of Palm Beach, Fla. Petty Officer 3rd Class Matthew Russell, a damage controlman assigned to Tactical Law Enforcement Team South, based in Opa Locka, Fla., was boating with his father, wife and younger brother the previous evening when their boat capsized about 10 p.m. An HC-144A Ocean Sentry fixed-wing aircraft found the four clinging to the hull of the capsized boat at 9:05 a.m. the following day. All were wearing life jackets. A Station Lake Worth boat crew took them to EMS personnel at the station. Petty Officer 3rd Class Michael Linehan, a rescue swimmer from Coast Guard Sector San Diego, climbs aboard a 30-foot sailboat in the Pacific March 21 120 miles southwest of San Diego. Air crews from Sector San Diego and Air Station Sacramento rescued a man and a dog on board. The Coast Guard&apos;s First District and the Massachusetts Environmental Police signed a memorandum of agreement Feb. 1 that defines how the state and Coast Guard will work together to oversee recreational boating safety programs in the Bay State. The agreement also helps the agencies exchange information about law enforcement, boating safety and search-and-rescue incidents. There have been 225 reported accidents and 39 fatalities in Massachusetts in the last three years. Of those, 65 accidents and 16 fatalities occurred during the last year. The Coast Guard rescued a 61-year-old woman from the Georgetown Channel near the Francis Scott Key Bridge in Washington after her single-person boat capsized on March 20. D.C. Metro Police contacted Coast Guard Sector Baltimore watchstanders about noon to report that a woman had fallen from a scull and was struggling to stay afloat. A 25-foot response boat crew from Station Washington, D.C., that was conducting training in the vicinity of the 14th Street Bridge responded, along with D.C. Metro Police and D.C. Fire Rescue personnel. 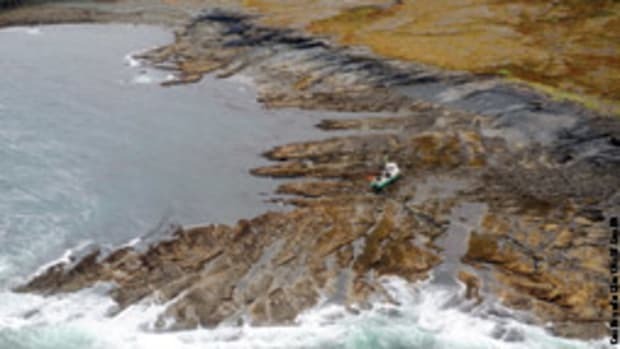 The Coast Guard crew threw the woman a life ring and pulled her aboard their vessel. 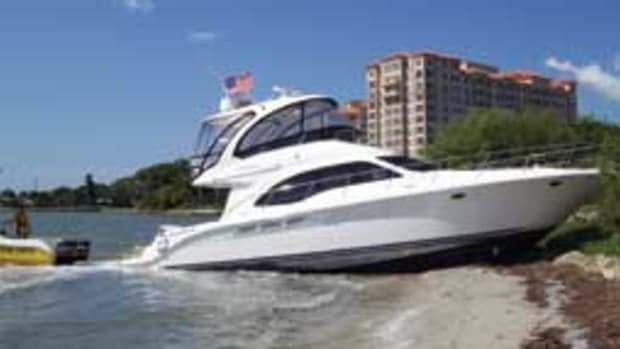 The crew then placed the scull in tow and took the woman to EMS personnel at Thompson Boat Center in Washington. She was not reported injured. 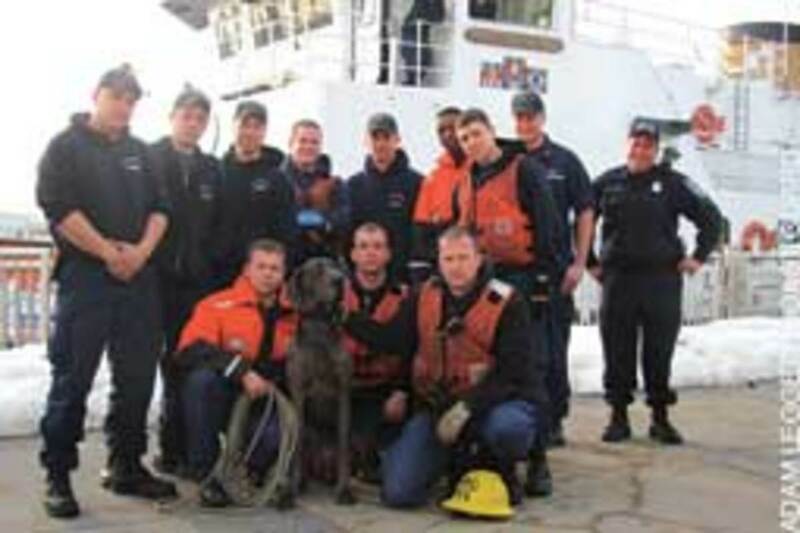 Crewmembers from the cutter Bristol Bay are shown with Bella, a Great Dane, shortly before she was handed over on March 17 to the St. Clair County Animal Society in Detroit. After a day of training, a crewmenber with a spotlight saw the dog wandering on Lake Huron ice more than three miles offshore. She was returned to her owners in Sarnia, Ontario. 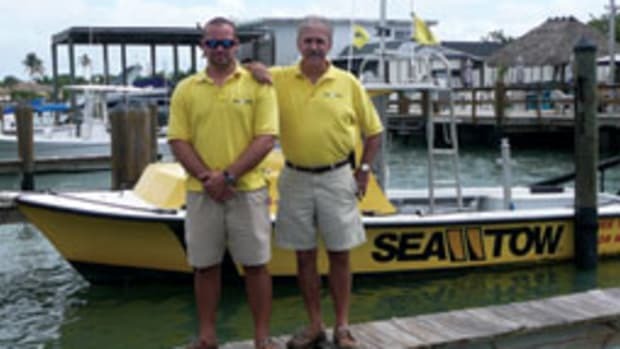 Investigators from Coast Guard Sector Hampton Roads determined that a sunken boat 4 miles northwest of Little Creek Inlet was a derelict, not a search-and-rescue case. 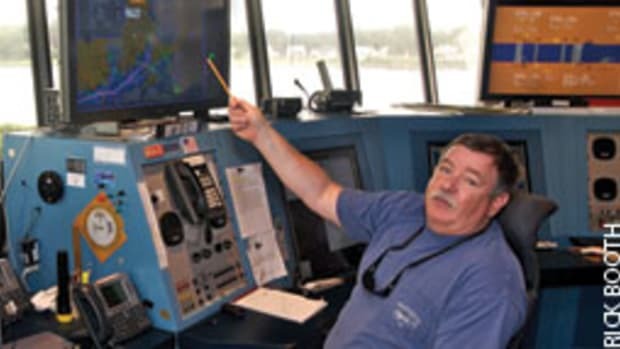 Crewmembers aboard the motor vessel Relentless reported seeing the boat March 18 in the vicinity of Thimble Shoal Channel to watchstanders at Sector Hampton Roads. 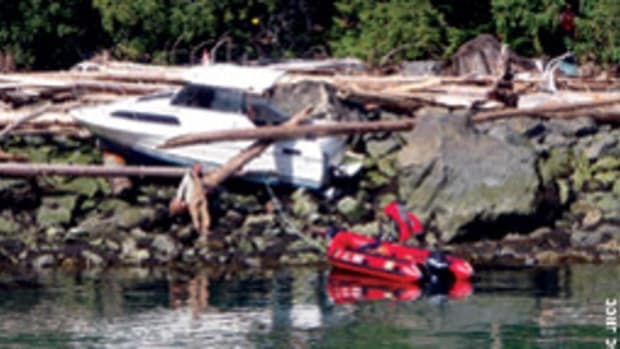 Coast Guard, Navy and local rescue crews searched for survivors. Divers and a remotely operated vehicle were dispatched to get more information about the submerged boat. 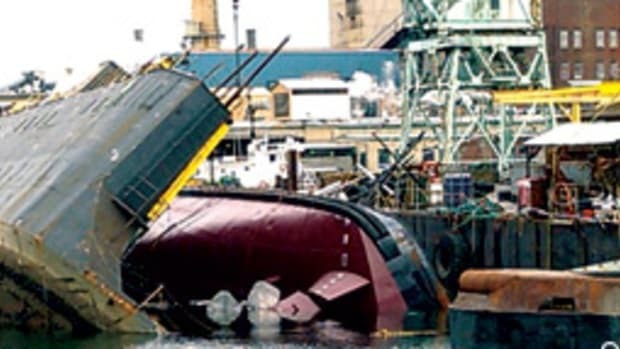 The divers reported that it had heavy marine growth on its hull and was missing its engine block, floorboards and wiring. Too large to be removed by the boats at nearby Station Little Creek, the derelict was marked as a hazard to navigation, and Sector Hampton Roads watchstanders issued a notice to mariners. 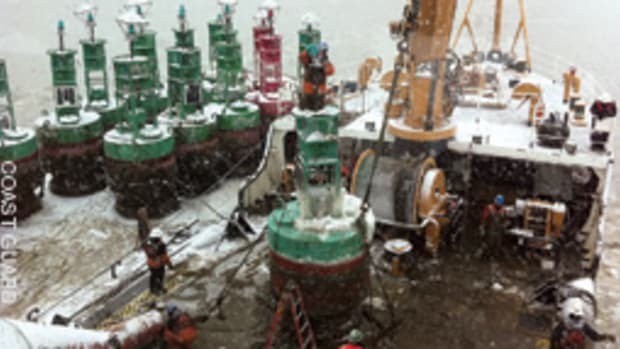 The Army Corps of Engineers was developing a salvage plan. 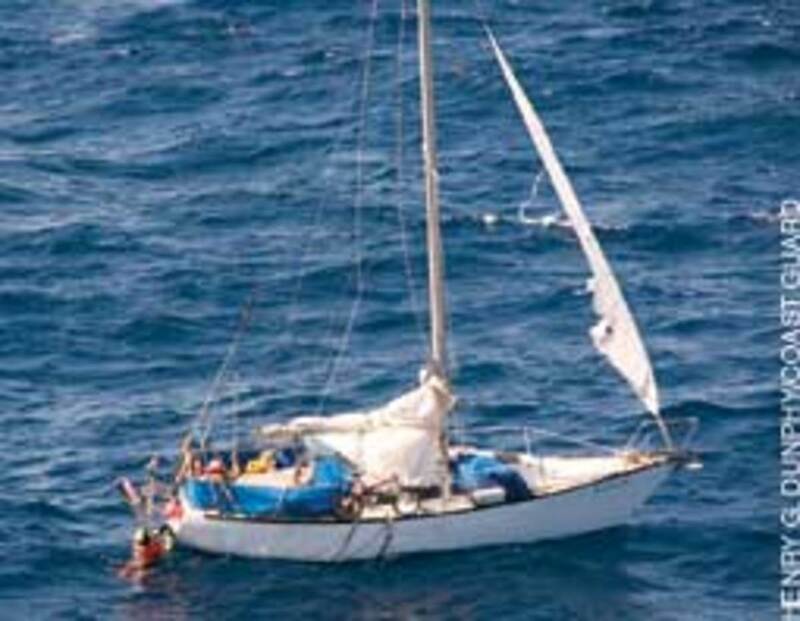 4-1/2 hour period, the Coast Guard responded to, among others, a mayday call from a vessel sinking off Big Pine Key, Fla., with two people on board; a sailing vessel whose owner was asleep on board that broke free from its mooring and drifted into Key West Harbor; and a 50-foot sailing catamaran with three people on board that struck the Long Key Bridge. Small-boat crews from Coast Guard Stations Islamorada, Marathon and Key West, along with partner agency vessels, were involved in the responses. One life was saved, 11 people were otherwise helped, and no injuries were reported. A barge removed the catamaran from beneath the bridge.